Nowadays, numerical simulations of plasmas are receiving a great deal of attention both in research and in industry thanks to the numerous applications directly connected to these phenomena. In addition, there exist many practical situations in which the so-called Coulomb collisions are fundamental for correctly describing the plasma dynamics as for instance in magnetic fusion devices (like tokamak devices). 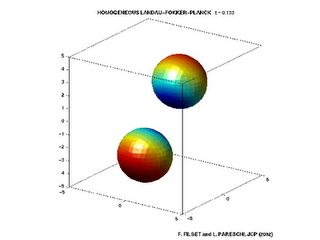 The Fokker-Planck-Landau (FPL) equation is used to describe the binary collisions between charged particles in plasma physics. A new approach for the accurate numerical solution of the FPL equation has been presented recently in [1, 2]. The method is based on a fast spectral solver for the efficient solution of the collision operator. The use of a suitable explicit Runge-Kutta solver for the time integration of the collision phase permits to avoid excessive small time steps induced by the stiffness of the diffusive collision operator. Here we present some numerical simulation of the relaxation process in a three-dimensional Coulomb gas (see [3,4]). We refer also to  for the development of Monte Carlo methods for the Landau-Fokker-Planck equation. with v1 = (1.25,1.25,0), v2 = (-1.25,-1.25,0) and the thermal velocity is vt=0.4. The final time of the simulation is T = 80. The movie reports the time evolution of the level set of the distribution function f(t,vx,vy,vz)=0.02 obtained with n=32 modes. Initially the level set of the initial data corresponds to two ``spheres'' in the velocity space. Then, the two distributions start to merge until the stationary state characterized by a Maxwellian distribution with zero mean velocity is reached. This is represented by a single centered sphere.